As we continue to celebrate Women’s History Month, we are taking a look at innovative projects that encourage girls’ interest in STEM activities. Created in California in 2009, Technovation Challenge has been inspiring and challenging girls around the world to solve real-life issues with technology. Peace Corps Volunteer Chip Moreland first wrote about Peace Corps Moldova’s involvement in the program in 2014 and it has been an increasingly popular secondary activity in the country ever since. In fact, the Technovation Challenge has been so successful in Moldova that girls and their communities are participating in multiple app creation workshops throughout the year. Technovation Challenge is the world’s largest and longest running tech competition for girls. Teams of young women come together with mentors and coaches to identify a problem in their community, create an app to solve it, code the app, build a company to launch the app in the market, and pitch their plan to experts, all in three months! The program teaches girls important life skills such as how to identify a problem, design and test a solution, collaborate with a team, and communicate to different audiences. Teams pitch and submit their ideas (through video) and participate in regional competitions. Once all projects are submitted, 10 finalists are selected worldwide to compete in the final competition in California. In Moldova, an organizing team composed of Peace Corps Volunteers and members of their host community, as well as a number of international organizations, partner to implement meetings and workshops like United Nations Women. The team helps plan and disseminate information about the program throughout Moldova to encourage girls ages 10 to 18 to create teams with a local mentor or coach in order to learn the skills needed to complete deliverables needed to submit for the competition. Right now there are 17 teams composed of around 60 girls and 25 mentors/coaches helping with curriculum implementation. The roles of the mentors and coaches are important as they are the ones to encourage and inspire the girls to keep going through the program as they learn and develop new skills, and oftentimes the mentors/coaches are also learning some of these new tech skills as well. Many teams are mentored by Peace Corps Volunteers, especially in the rural communities. This is both beneficial for those communities and for girls who can envision opportunities that may only appear to be available in more urban areas. There is a great deal of community support through local partnerships and sponsorships as they see the importance in providing opportunities for young girls in learning tech skills. Long-term benefits include the possibility that these girls gain an interest in learning tech skills and may pursue a career within technology or something they may never have thought of but through this program they may see a different perspective or option as they learn about various opportunities that are available in this field. This year’s Technovation Challenge is off to a robust start. In January, Volunteers hosted a launch event called Girls Make Apps to kick off the 2016 season. More than 75 people participated, including girls and their mentors/coaches. It was an incredible opportunity for participants to meet other girls, gain new ideas, learn how to use the AppInventor program, and return to their community with a new energy to begin working on their projects and ideas to dominate the competition. 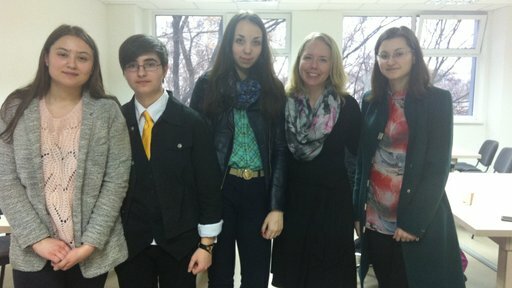 The teams are looking forward to Moldova’s regional pitch event that will take place on April 24. By May the semi-final round and final round will be selected, and then the World Pitch event is July 10-14 in San Francisco. Learn more about the Technovation Challenge here. See how you can contribute to workshops like Volunteer Sara Hoy's on our Peace Corps Partnership Program page.